Astronaut John Grunsfeld stand on a foot restraint and prepares to replace a radio transmitter on the Hubble Space Telescope. Astronaut John Grunsfeld, famous for visiting the HubbleSpace Telescope three times on space shuttle missions, has left NASA to helplead the observatory's science work. Grunsfeld has taken up the post of deputy director of theSpace Telescope Science Institute in Baltimore, which runs science operationsfor Hubble. A self-identified "Hubble-hugger,"Grunsfeld, 51, recounted his most recent trip to the observatory to an audienceof astronomers this week at the 215th meeting of the American AstronomicalSociety in Washington, D.C.
"The Hubble story is just beginning," he saidWednesday. "We've reinvented the telescope." Grunsfeld and six other astronauts travelled to Hubbleaboard the space shuttle Atlantis' STS-125mission in May 2009. It was the fifth and final scheduled repair trip tooverhaul the 19-year-old telescope. "I was just so happy that we'd gotten everything doneand we hadn?t broken the telescope, as far as we knew," he said. In fact, they did a lot more than that. The astronauts installedtwo new instruments on the observatory, including a new wide-field camera, andreplaced some ailing parts such as batteries and gyroscopes. Thenew-and-improved Hubble should be running well through at least 2014, NASAsaid. 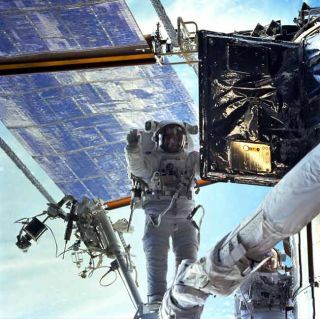 Grunsfeld, who also participated in two prior Hubbleservicing missions, said he feels a personal connection to the instrument.After his lastspacewalk, he gave one last pat to the telescope. "I said, 'Hubble, you're the man,'" he recounted. Grunsfeld is an astronomer by training who was selected byNASA as an astronaut in 1992. A veteran of five spaceflights total, he haslogged over 58 days in space. NASA announced Grunsfeld?s departure from thespace agency earlier this week. "During the past 18 years, John has been a true assetto the agency," said NASA chief Charles Bolden, a former astronaut who fewon the STS-31 mission that deployed the Hubble. "Some have called him thechief Hubble repairman, but I call him a friend and wish him the best in hisnew endeavor." In his new post, Grunsfeld will help oversee the scientistswho work with the observatory, and the selection of science projects that getchosen for precious Hubble time. "This is a very human endeavor," Grunsfeld said. "TheHubbletelescope doesn?t discover anything. Astronomers, people, using the telescope,discover things."